Hello Minneapolis drivers. Today, we're talking about disc brakes. Your vehicle weighs several thousand pounds and it takes a lot of force to bring it and your passengers to a safe stop – so everything needs to be in good working order. The wheel hub keeps your wheel attached to the family car. 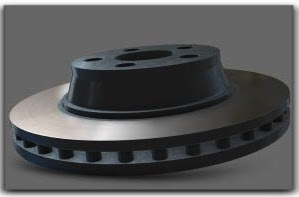 The brake disc – or rotor – is attached to the hub and spins with the wheel as you drive. Your brake pads clamp onto the rotor to slow the wheel. The brake caliper straddles the rotor and squeezes the rotor to slow it down. The calipers contain brake pads which rub on the rotor when you step on the brakes. The brake piston causes the calipers to squeeze and release as you use your brakes. Your family car brake pads start to wear the first time you step on the brakes. Eventually the pads are worn out and need to be replaced. If you don’t replace brake pads when they’re worn out, the metal parts of the brake will grind against the rotor and carve grooves into the surface. If a scored rotor isn’t too bad, your cheerful Minneapolis technician can put the rotor on a lathe and smooth it out. If the grooves are too deep, or if the rotor is warped or cracked, you need to replace it. At Mr Tire Service, we have been servicing disc brakes for Minneapolis drivers for 8 years. Servicing disc brakes at Mr Tire Service require special attention to the mechanical sliding and mounting portions of the system. Your Mr Tire Service service supplier knows the special needs. Sometimes brake pistons can stick and must be replaced. Typically it’s cheaper to replace the entire caliper at Minneapolis auto service centers than to rebuild the piston. So there you have it – a brief Mr Tire Service guide to how your disc brakes work. Minneapolis drivers who replace their brake pads on time will not only keep their family car stopping safely, but could save money on unnecessary brake repair down the road.